We say, many times, מפני חטאינו גלינו מארצנו. This is undeniable, and a basic tenet of Judaism. It goes to the concept of שכר ועונש Reward and Punishment (with apologies to Camus) and without which there could never be בחירה חפשית, free choice. Mankind was handed the choice, and through those choices, God through his נסתרות, his Godly account book, decides when, where and how we will get what is “coming to us”. To pretend that any human being can fathom Godly logic is simply heretical in my opinion. It implies that using one’s own logic and calculations they understand the Godly ledger and plan. This is tantamount to imagining that a human being can work at that level, and that is heresy. We are given hints, advice, and when there was נבואה the direct word from God. We were also given the gift of תשובה which for matters between Man and God, we have the capability of being forgiven at opportune times, or even יש קונה עולמו בשעה אחת. It’s an involved process as outlined by the Rambam in הלכות תשובה, but it’s do-able. If we are earnest, Hashem is there. For matters between man and man, it is more difficult. Man’s capacity to forgive, despite the dictum of והלכת בדרכיו is disturbed by man’s frailties and predilections. Accordingly, one may have all the correct intentions, and yet, the person from whom one seek forgiveness refuses your entreaties (there are הלכות about how many times one must seek such forgiveness but ואכמ’’לֹ this is not the place to discuss these). Who can say why Hashem hid his face so to speak, and allowed an atrocity such as the one in Har Nof to go ahead? The Rambam says that those who attempt to ascribe reason are מאוס they are despicable. There may be some imbued with temporary phases of רוח הקודש and even non Jews who are given the power to see into the future (Bilaam is a famous example). But what does that mean to the public person in the street? I can’t speak for the man or woman in the street, but I can speak for myself. My own view is that if a universally respected Rov, whether they are a Kabbalist, a Rebbe or a Rov, or whether it is one’s Rav Hamuvhak, one’s “special” Rabbi, suggests that following events, a person, each person, should retrospect, and seek to improve themselves in ways that actually may and will vary according to the vagaries of one’s pattern of sin needing improvement, then this is correct and proper. I also think that the timing for such statements is critical, and in fact, need not be tied in specific terms to a particular incident. When we feel most vulnerable, we are most amenable to listen, in general. Do we still feel their pain after Shiva or Shloshim? A Rabbi who thinks they know “the reason for the Holocaust” or “the reason for the Chmelnitzki massacres” or “the three boys who were kidnapped at bus stop and murdered” or the Rabonim גזע תרשישים butchered while davening in Tallis and Tefillin is as close to an heretic as I can imagine. Unless they can show consistent רוח הקודש and some accompanying supernatural influence from above that can be tested and verified, what gives them the knowledge or power to be able to second guess God? This, to me is the height of חוצפה and bad manners. Somebody once asked the Klausenberger Rebbe why he does not go to the demonstrations where they shout שבת and throw stones (who did they learn this stone throwing tactic from?). He shrugged his shoulders. The questioner was not satisfied and pressed on by saying that it was a Torah command to complain about those who are less observant in certain ways. 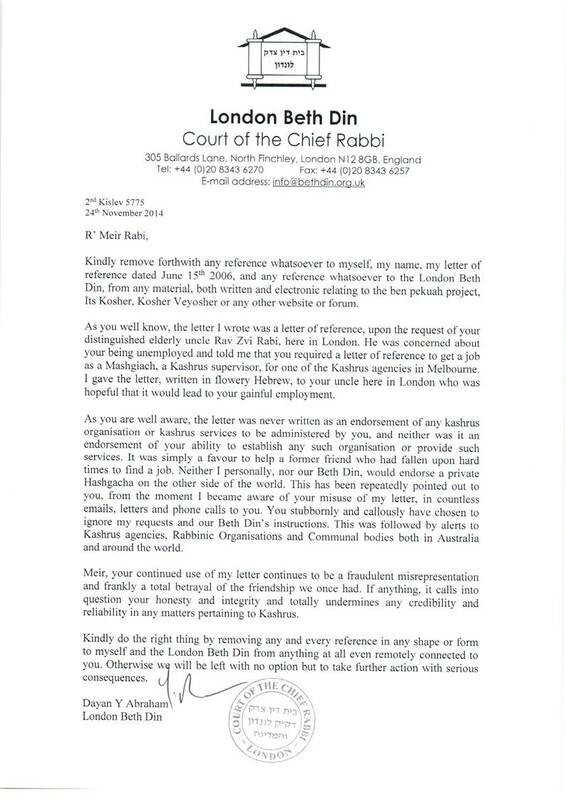 The Klausenberger Rebbe answered, nu, did your protests help? Did they do any good? We already saw from Ya’akov Avinu, and presumably the Malach in Rivkah’s tummy, that when Eisav wants to go into a house of Avoda Zora, any yelling and screaming didn’t help. To admonish implies there needs to be a reasonable chance that the admonishment will help. If it doesn’t, you may well be pushing the person further away from Judaism. Achronim pasken this way L’Maaseh. We saw three grades of reaction to this tragedy. The first was from the שונאי ישראל the arch haters of Jewry, the Neturei Karta. These low lifes had the unmitigated gall to actually attempt to comfort the family of the ישמאלי who had topped himself, and about whom the modern blood libel that “the Jews killed him” was swallowed “hook line and sinker.” They have been put in Cherem by many. Do they exist in Melbourne? Yes, they most certainly do. The next grade of reaction was that of one of the Satmar Rebbes. There are two. They fought and continue to fight. As usual his thoroughly offensive comments were not only extremist, but dripping with a lack of compassion. In the midst of the Shiva for יראים and שלימים, not to mention the Druze who is in גן עדן as one of the חסידי אומות העלם he trotted out the headline grabbing “reason” that is the hallmark of the vacuous movement known as Satmar. Who are they, and who is he, that he knows why Hashem allows things to happen? Does he also go public with his advice to his own Kehilla about the hushed pedophilia in that community? What is the reason for such? Which lunatic would claim that the reason for that phenomenon is due to the fact that they are anti the State of Israel when their Rebbe, R’ Yoel was saved by Zionists whom he despised! It’s all documented, not by artscroll of course. They tell me that R’ Yoel was not such an extremist in reality, and that when he heard of the death of any Jewish soul, would weep uncontrollably. I hope there was not a remote smell of triumphalism in the Satmar community that the murders in Har Nof, and the problems in Yerusholayim are due to “we are right, and you are all wrong”. That attitude stinks to high hell. If R’ Yoel had רוח הקודש why did he go to Israel and leave penniless. He failed dismally in Israel. Did he make a mistake? Are you allowed to say such things? The third grade of reaction was the incredible one from the actual אלמנות of the slain Rabbis. They didn’t want any arguments or finger-pointing over Shabbos. They wanted no Loshon Hora or Rechilus or speaking ill of others. For this reason, in my home, their wish was respected and we tried our outmost to expel any negativity, and personally I did the same. This post would have been written on Friday, but as soon as I received their request, I was frozen, and resisted. Are there Satmar in Melbourne? Plenty. We all have much on which to improve. Stop being God’s accountant. Be your own accountant. Each of us knows exactly the aspects which we need to improve. If you don’t, that’s your first problem. It isn’t the same for everybody, nor can we be lumped into some group, all transgressing certain or the same sins. Faith, according to Rav Soloveitchik, is about not questioning. It is about axiomatic acceptance. The only time questioning is a useful activity is if one has accepted the axioms, and uses questioning to enhance their understanding of the ways of Hashem. I refrained from posting pictures of the first two grades of people because frankly, they don’t deserve a bit or byte. Perhaps a bite according to the Gemora. Whilst I do not disagree with any of your comments, were they in the spirit of the request from the widows, for no finger-pointing, no division? Or was that just for Shabbat? No they were not. I’m not sure you or I have a license to extend their shabbos request to a week or two or three of not commenting on reprehensible behaviour. Having fulfilled the request, I felt it critical to point out the fallacies of the concept of God’s accountants. I do so not to separate myself from them (although Neturei Karta are in Cherem well before this) but to discourage this canard of Judaism, which does nobody any good. It must not be pushed off to the side. If I see Satmerer on the street, I ask them this directly. I’m not a head master who is bound by certain diplomatic lines of engagement. On Shabbos, when I heard people begin to talk about such, I removed myself from all and every such conversation and discouraged it. G-d’s accountants have submitted their findings. Actually we do not know who printed and published it.They were careful not to reveal their names. If they would not be afraid they would put their names and all the titles they bestowed on themselves to the document. A real Hastarath Ponim. All we know is that the printers are פרסום מהדרין . Next Next post: Donate to the Har Nof fund?